Author Mazen Kharboutli has published his latest book providing a reflection and manifestation of the real-life back story that inspired it. Life experience has been the greatest teacher and motivational impetus for author Mazen Kharboutli’s writing. In “Two Roses,” his first work of fiction for adults, Kharboutli presents an entertaining and inspirational fictional narrative based on truth. Through the protagonist, Kharboutli demonstrates the power of the human heart to stumble, rise, release the past, forgive, heal and ultimately confront the power of self-awareness. The answer to these existential inquiries found resolution in one person who, Daniel believed, was the love of his life. However, due to unknown circumstances, she vanished without a word of explanation. For over two decades, he searched for reasons and eventually through a series of astonishing coincidences, he came full circle and gained renewed perspective. Readers will journey into Daniel’s world which will ultimately help them to encounter their own truth. Mazen Kharboutli is a civil engineer, prominent businessman and proud father of four. He juggles many tasks, loves family time and travel. Recently, he added “author” to his impressive achievements. He has successfully published two children’s books – “My Rabbit’s Tale” and “Friends Are Forever,” both of which he co-wrote with Dianne A. Rhodes. He enjoys topics that address the human condition, relationships and personal growth. 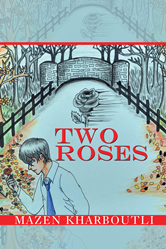 “Two Roses” is his first fictional narrative, infused with truth. Kharboutli currently resides in Dearborn Heights, Michigan.